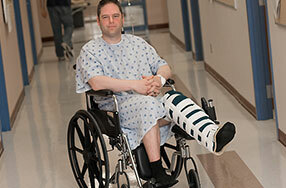 Orthopedic injuries include a broad spectrum of injuries and fractures to bones. Bone fractures are usually classified as either non-displaced or displaced fractures. A non-displaced fracture is a crack in the bone without a separation. A displaced fracture is a separation of the bone and can include comminuted fractures which involve fracture of the bone in multiple pieces. When these injuries occur, sometimes it is necessary for an orthopedic surgeon to do a open reduction and fixation surgery to install plates, wires or screws to put the bones as close as possible back into their anatomical position. Other times, with non-displaced fractures, it may be possible to cast the injury and wait for the fracture to heal. The most serious fractures usually involve the larger bones in the body, including fractures of the femur, pelvis and skull. However, fractures to the feet, hands and other bones can also present major medical challenges. At Kraft Davies, PLLC, our personal injury lawyers have a detailed understanding of orthopedic injuries and the challenges that follow bone fractures. Because we understand the medical issues, we are able to effectively present our clients' stories so that others can understand the full impact of their injuries. From workplace injuries to motor vehicle accidents, we devote our resources to helping clients achieve maximum fair compensation from liable parties. Have you received a broken bone or multiple fractures in a serious accident? To defend your right to full and fair compensation, contact us at 206.624.8844. For some orthopedic injuries, patients may have to undergo open reduction and internal fixation (ORIF) surgery to return fragmented bones as close to their anatomical locations as possible. These surgeries require the installation of plates, pins and wires to hold the fragmented bones in place during the healing process. Following surgery, patients may also develop problems with hardware installed during surgery and may require follow-up surgery to remove hardware. Even if the surgery is successful, patients will most likely require months of physical therapy or occupational therapy to restore mobility, and may require the use of a wheelchair or crutches. Recovering orthopedic injury patients may also develop compartmental syndrome, which if not treated may result in a need for limb amputation. Ongoing pain and discomfort because of reflex sympathetic dystrophy (RSD), chronic pain, arthritis or arachnoiditis are also common medical issues our firm handles. When joints are damaged, it may be necessary for the patient to undergo joint replacement surgery, including shoulder replacement, knee replacement or hip replacement. When we take an orthopedic injury case, our attorneys take time to understand the full impact of your injury on your life. While a settlement is sometimes the best way to resolve a personal injury case, we are not quick to negotiate away your best interests. Our attorneys prepare each case for trial from the beginning, and we will take your case to the courtroom when necessary to protect your interests. If you or a loved one has suffered complications from an orthopedic injury, contact us to discuss your case in further detail with one of our experienced Seattle personal injury lawyers. We offer a free initial consultation and case evaluation at no obligation for all prospective clients.